Happy 30th Birthday Pi Mu Chapter! 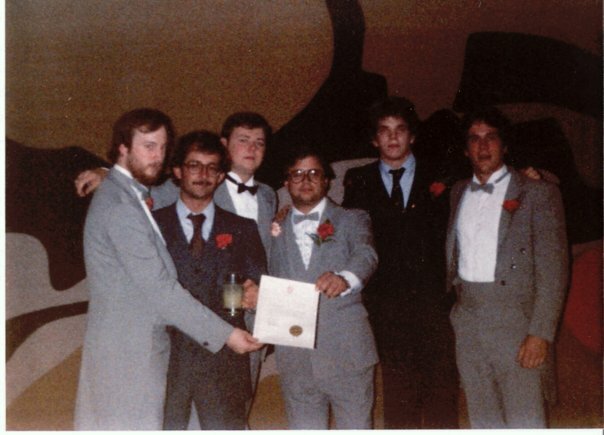 On April 24, 1982 thirty seven men from Buffalo State College were were granted a Charter for the Pi Mu Chapter and inducted into the bond of Tau Kappa Epsilon. The induction was overseen by Silver Maple Leaf Award winner Ed Dominey, future Grand Prytanis Tom Castner and the Grand Hegemon Jim Margolin who became a future Grand Prytanis. The Induction dinner was held on the 38th Floor of the HSBC building. 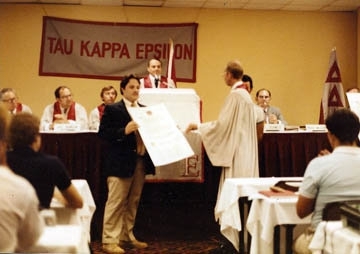 Later that summer, Tim Moran traveled to TKE Heaquarters in Indianapolis to officially accept the Charter on behalf of the Fraters of Pi Mu Chapter. Tim Moran accepting the Pi-Mu charter on behalf of the chapter At the 1982 Tke Uprising. Come join us in celebration of this anniversary on Saturday April 28th, 2012· 6:00pm – 11:00pm. Click here for more details.